Every Christian will go through the painful and scorching heat of the desert at one point or another. Our desert is of a different kind, but just as painful to our souls as the natural desert. We like to call our kind: “a spiritual desert.” Moses spent forty years in the wilderness himself before spending forty more years with the children of Israel. 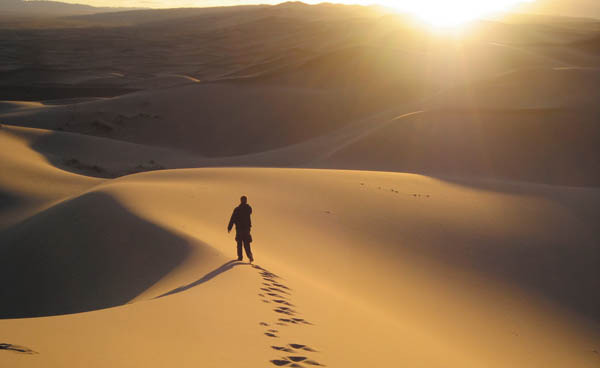 Other words to describe a desert are: “Barren region or wasteland.” With little or no water, no fruits, no vegetables, no eatable animals, with extreme heat during the day, uncomfortable cold weather at night and little or no rain; a desert is a place where not many survive. There are no restaurants, no supermarkets, no Wal-Mart’s, no drive-thru and no stores on every corner. Without a doubt we Christians find a common place in our spiritual wasteland. Jesus was led into the desert by the Holy Spirit; this is significant! Many times we find ourselves rebuking the devil and all kinds of spirits and we get frustrated because we don’t see any manifestation of healing or breakthrough; that is because the devil nor any evil spirit has anything to do with it…it is a God thing. In the desert, we learn two things: 1) we learn to depend only in God and 2) We learn to defeat the devil in the power of God in spite of our emotions. It is hard to walk through the sands of loneliness. However, day after day we learn to recognize that it was God that sustained us and we grow in our trust for Him. If God can provide and keep you alive in the desert, how much more can He do in the fertile lands of prosperity and abundance? The normal challenges of life will become minuscule to the person that has experienced the wilderness; you will find yourself strengthened in your faith. We can’t step into an effective ministry without defeating the devil in his own game. In the desert, we learn that even when we are at our weakest point, God has given us enough power to overcome the devil and to overcome the world. We are going to need that kind of confidence and assurance as we step out in ministry and as we walk-out this Christian life. After forty days, before Jesus presented His fasting; at the peak of his weakness, the devil came to tempt him. However, Jesus gave us an example of the power of God for all of us to follow. Jesus defeated the devil in the desert; it was His personal victory against the enemy! However, Jesus’ victory in the desert was not enough to provide a plan of salvation for the world. In the desert, Jesus pulverized the devil; on the cross, He opened His arms to humanity. Beloved, the desert is preparing you for battle! Your desert is preparing you to engage in the fight to win the souls of men. Prepare for battle! Next Next post: Asked To Do Something That Makes No Sense? Consider Noah’s Task! I am not sure God sees the desert this way, Angel. In Hosea 2:14, speaking of Israel as if the nation were His unfaithful wife, He says, “Therefore, behold, I will allure her, bring her into the wilderness, and speak kindly to her. Then I will give her her vineyards from there, and the valley of Achor as a door of hope. And she will sing there as in the days of her youth, as in the day when she came up from the land of Egypt.” The desert has been, and will continue to be, a place where God can effectively cut us off from our dependence on this physical world and develop deeper, loving trust in Him. It’s a preparation for better things, a place of intimacy with Him. What do you think? Good Scripture and observation Dennis. It takes me deeper! We are three in one, just as God is Father, Son and Holy Spirit. We are spirit, soul and flesh. What I felt as I read your comment is that the desert, as we prepare for battle, is a place designed to kill SELF –FLESH- and it is the place where we learn to be more sensitive to our Inner Most man -Our spirit man- Our spirit man is the one that is always willing; but the flesh is weak. Jesus was led into the desert “to be tempted by the devil.” He defeated the devil as Jesus stood on the Word and obviously in the Spirit. Many of us go into the flesh when faced with the desert (I know I did for a season) The children of Israel did; that is why so many died there. Nothing will develop our true spiritual awareness on God like the desert. So even as the wilderness can get wild, as the flesh fight that thing off, at the end, as we embrace it, God will get out of us what He wants. One of the objective of the desert is for us to be trained in listening to God and in trusting Him in the mix of “Nothing”. He becomes our obvious hero! As we come out of the desert we come out victorious we renewed faith and strengthen in the Lord! The desert for Jesus was not a place for God to deal with Him, but for Him to do a face to face battle against the devil. What do you think? I’ve heard it said more than once that every Christian on this earth is either in a battle, coming out of a battle or going into a battle. So our life in the desert here on earth is a good preparation for our life in eternity. The battles we prepare for with the Lord at our side prequalify us for the responsibilities and level of authority that we will have in His Kingdom for ages to come. We have the opportunity to grow in love with Him, to learn deep trust, in a way we could never do in Heaven, where we have no enemy and where we see the Lord face to face. Here we only see through a glass darkly. Here we have to exercise faith like a muscle we are training. Here we have to trust the Shepherd will find us grass or will show us how to escape what looks like a box canyon with no exits. We all face enemies whose power seems greater than our own, some days more than others. And it is easy to become discouraged if we focus on our resources and strength, especially when these seem to pale in comparison. It is also likely we will give in if our eyes are set on that of which our enemies are capable. But, when we remember by whose strength and power we fight, when we are mindful of who is fighting for us, we can rest in the knowledge that He will give us the victory. Amen! Can’t wait for Saturday my friend… Our first meeting of the year! God is speaking… are we listening?